Now offering painting and coating for semi and heavy trucks, industrial equipment, fleet trucks and vans, farm equipment and projects up to 40 feet! North Carolina’s Commercial & Industrial Coating and Paint Super-Shop! With our expanded half-acre facility, we can handle almost any size metal coating or paint job! Elite Custom Coatings now features one of the Southeast’s largest coating and specialty paint facilities in the southeast. Our newly expanded facility includes a half-acre of buildings houses state-of-the-art equipment and oversize paint booths to accommodate most any project and ensure unparalleled quality. Our powder coating shop, CARC and coating application facility, industrial paint shop, and iron fabrication shop cover 22,000 square feet, all sitting on several acres of guarded land to store our work. Our facility is 5 minutes off I-40 (just off US 401 in south Raleigh), and features a drive-through drop-off- pick-up center, large enough to accommodate large freight trucks. In addition to a best-in-class facility, Elite Custom Coatings offers a professional staff with experienced metal fabrication, painting and coating experts. We have specialists who can assess your needs and offer the proper coating solution for your needs. Our team includes expert sandblasters/prep technicians, as prep is the most important part of the process. 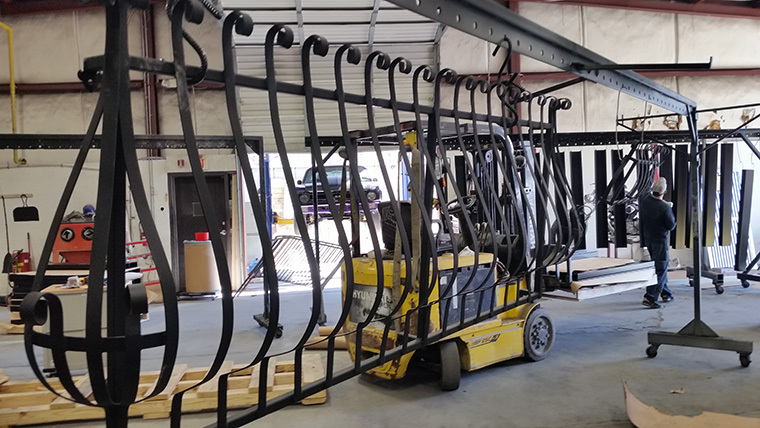 Our coaters have years of experience, and we can also offer iron and metal fabrication services for a “one-stop-shop” convenience. Perhaps most importantly, our client relationships define who we are. We are the ones you can always rely on to provide expert service, on time, and on budget. Even when it’s an emergency! In addition to perfecting the look and application, we can help you with the particular project you have in mind, from functional products to decorative items, all sizes included.